The City Council on Tuesday overwhelmingly approved a plan allowing a developer to build two office buildings atop Chelsea Market, a project that would significantly expand a familiar neighborhood landmark which houses a popular food emporium. The final vote, 41 to 1, was an anticlimactic conclusion to a raucous public process over months in which many residents bitterly criticized the plan. The proposal had been a nettlesome one for Christine C. Quinn, the City Council speaker, because the building is in her neighborhood and pitted major constituencies against one another. But last month, she brokered a compromise. Under the proposal, the developer, Jamestown Properties, will build an eight-story, 210,000-square-foot building along 10th Avenue, and a seven-story, 80,000-square-foot building along 9th Avenue. Jamestown will allocate roughly $13 million for a new fund, to be administered by the city, for the High Line, to help pay for capital projects like adding bathrooms and building a freight elevator. Jamestown will also contribute nearly $5 million to a fund to build low- and moderate-income housing in the area. 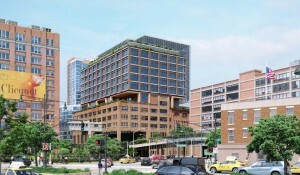 The proposal also guarantees that Chelsea Market’s distinctive facade will not be altered, and that 75 percent of the ground-floor retail space will be set aside for food-related businesses.